ST. THOMAS- School spirit remains low as the University of the Virgin Islands’ male basketball team ended the season losing all of the 10 games played. With a team of only eight players, the Bucs faced many struggles this season that may have contributed to the 10-game losing streak, disappointing fans, coaches and the university community. Due to many last years’ team being no longer qualified to take part in the Inter-university Athletic League, coaches recruited as many as 25 potential athletes during the summer and fall semesters. Twenty students attended the tryout but out of the 12 that were accepted as players, many failed to meet the academic participation requirements of the league. According to the IA League, each player is required to earn 12 credits each semester and a cumulative grade point average of 2.0. Additionally, the university requires that each player is required to attend a mandatory study session of an hour and a half, but questions have been raised to whether or not this is sufficient when practices are held for at least three hours three to four times a week. Additionally, former captain and shooting guard Salim Ross suffered a major torn knee ligament, in the second quarter of the pre-season 2013 Paradise Jam game against the Gators of Universidad Metropolitan. This was the first preseason home game in the last five years that the Bucs have lost. Ross took a leave of absence from school to complete necessary surgeries and rehabilitation sessions. 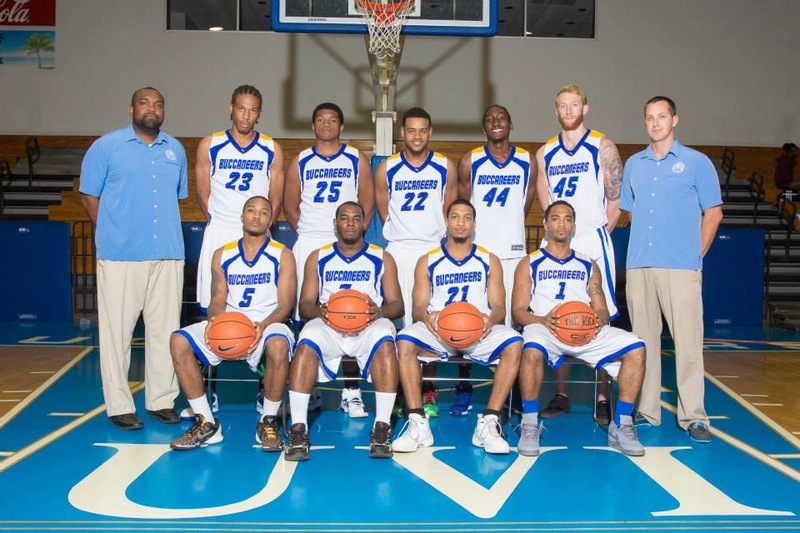 Photo Caption: University of the Virgin Islands 2014 basketball team. Game statistics show that the Bucs came very close to winning many of the games, including their final home game on March 8 against the University of Puerto Rico-Central Bayamon, which they lost by only two points. They also lost to the Owls of the University of Puerto Rico-Humaco by two points. UVI is no stranger to losses when it comes to basketball, but after making it to the playoffs last season, fans who had built up excitement and expectations were disappointed once again. Though disappointed, Interim Athletic Director Curtis Gilpin expressed faith in the team. “It was a disappointing season for all,”he said. “I’m pretty sure we could’ve done much better. The varsity basketball games are one of the few options that students have to participate in athletic activities that can encourage school spirit on campus. Last semester, the Athletics Department in conjunction with the Student Government Association Sports Committee hosted a Pride Day with a pep rally to introduce all athletic team players and to encourage students to attend the first home game of the school year, but few students attended. Head coach Ryan Skinner could not be reached by press time.